Keep The Roads Safe For All! Be neighborly!Volunteer to shovel snow for elderly and disable residents who can't clear their walks. Please do not set your garbage cans in the road, as the plows must work around them, crossing the centerline of the road in the process. Do not park vehicles in a cul-de-sac, especially those with landscaped centers. This makes it impossible to properly clear the snow from these areas. Make sure your children do not play in any large piles of snow located near the roadway. These mountains of snow look appealing to the children, but can be very dangerous when the plows are pushing snow. Snow left out in the road by homeowners or private snow plowers is a road hazard. We have all come upon this situation where we are driving along and come across a wall of snow trailing out of a driveway across the road. Snow should never be plowed onto or across the roadway. The proper way to plow a driveway is to start at the mouth of the drive and plow in. There should be a designated area to store snow in your yard. Another danger is when snow is pushed across the road and piled on the berm. As the winter progresses these piles work their way out into the road. This hard-packed snow can push a snow plow across the centerline into on-coming traffic. All homeowners and snowplow contractors should be aware that they can be cited for placing obstructions, including snow, on the roadway. If you hire a snowplow contractor and they are leaving snow in the roadway or piling snow in cul-de-sacs or on the berm, please inform them of the inherent problems and dangers these actions can cause. By working together we can make this a safe winter season. We use DTN Weather Service a weather monitor system that provides our snow crews with current weather information 24/7 and is located in a easy access area at the Service Department. Primary streets are plowed first, followed by secondary streets. 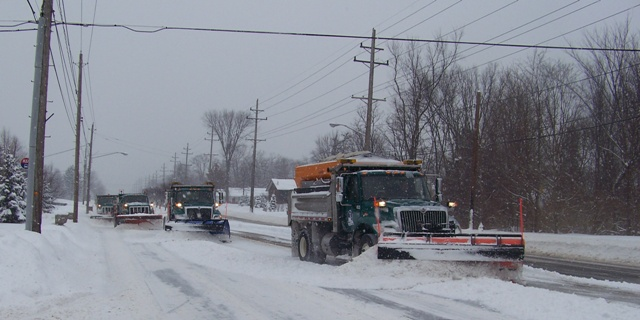 The first priority is the emergency snow routes and other main collector streets, which connect major sections of the City to provide access for emergency fire, police, medical services, schools, and commercial businesses or area bus routes. The second priority is the residential streets. During heavy snows secondary streets will only be salted at hills, intersections and turns until the storm passes. Please note that cul-de-sacs are plowed last and that city snowplows are prohibited from plowing driveways or towing private vehicles. It is the City of Brecksville’s current policy that private streets are the property owner’s responsibility for any snow removal activities. All sidewalks adjacent to private property are the responsibility of the property owner. Snow placed in driveways by City plows is the property owners’ responsibility for removal. Snow from a private driveway may not be placed on or pushed across a City street. The City will only clean snow within the confines of curb line to curb line of a street. This priority system keeps open the roads that serve the greatest number of people. At times, heavy slush discharged from a plow will knock down a mailbox. Most mailboxes, if properly placed and installed, will withstand heavy slush. The City will NOT be responsible for damage done to mailboxes knocked down by heavy snow or slush. Before winter please make sure that your mailbox is properly fastened to the pole. Your assistance is needed in removing the snow from in front of your mailbox. The extreme ice and snow packed around the mailbox prevents city trucks from removing the snow without causing damage to the mailbox. 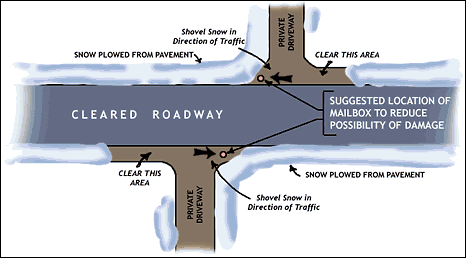 The above sketch shows how your driveway can be initially cleared to reduce the possibility that after the plow passes you will be snow bound again. We suggest that you clear your driveway in the manner suggested in the sketch. If you will shovel snow in the direction of traffic, and make a pocket next to your driveway as shown, snow accumulation on the plow will drop into that pocket and only a bare minimum will go into the driveway opening. Top Things You Can do to Help the Service Dept.